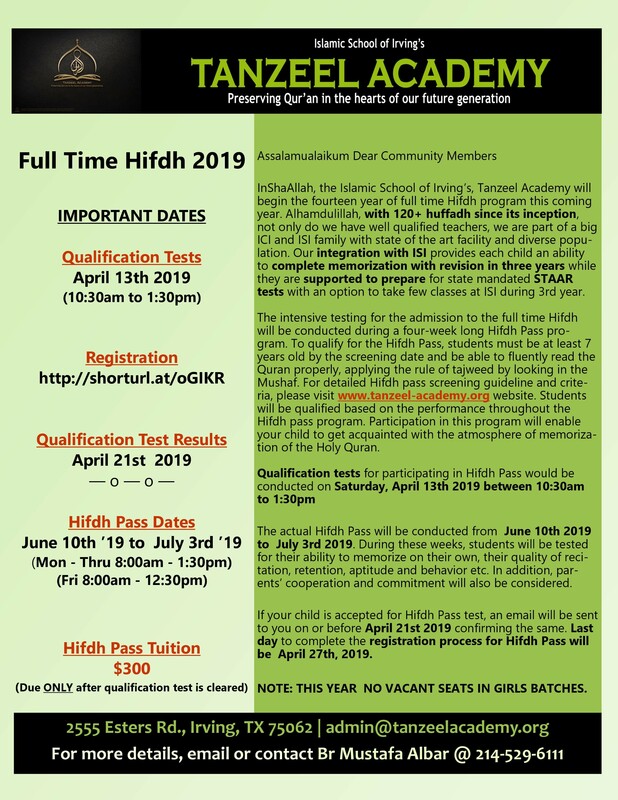 Alhamdulillah ISI’s Tanzeel Academy boasts an impressive Hifz Program. With the blessings of Allah SWT, over a hundred of our students have completed the memorization of the entire Quran thus far; with nearly sixty students currently enrolled in the full-time Hifz program with the blessings of Allah SWT. While attending the full-time Hifz Program, students study core secular subjects at home and participate in the standardized testing. If needed, after school tutoring is also available to them. This arrangement facilitates a smooth transition back into the regular school upon their completion of Quran memorization. Tanzeel Academy graduates are top performing students in their respective grades. Please read on to learn more about the programs that Tanzeel Academy offers and for the contact information.